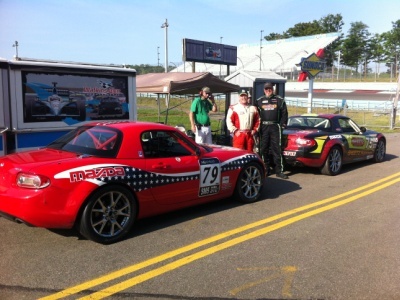 The Mid-Atlantic Road Racing Series (MARRS) held its fourth and fifth regional SCCA Club Racing events of the 2012 season on Saturday May 26th and Sunday May 27th at Watkins Glen International Raceway in Watkins Glen, NY. This was a joint NJRRS event on one of their home tracks. As with the previous 3 MARRS races in 2012, Larry and Ted Cahall practiced on Friday and brother Bob joined them late Friday night for the two days of racing. Ted again ran in three classes: SM, SM5, and STL. Bob and Larry each ran in the SM and STL classes. On Saturday Ted qualified 3rd out of 4 cars in SM5. He also qualified 3rd out of 5 cars for the STL class and 11th out of 15 cars in the SM class. Larry and Bob qualified 14th and 15th out of 15 cars for the SM class. Saturday was action packed with the Cahall brothers in three different run groups. Ted finished 3rd in the SM5 race. In the SM class race, Ted finished 9th and set a new personal best lap with a 2:23.084, Bob finished 13th, and Larry 14th. Ted had a fantastic start, was running 8th and closing in on Nick Bruni who was slightly held up in traffic until a full course double yellow occurred. This allowed some of the cars that had trouble at the start to catch the pack. Once the double yellow cleared, Mike LaMaina passed Ted to take 8th place. The STL race was a bit more exciting with Ted finishing 3rd, Bob 4th and Larry 5th - with Bob setting a new personal best of 2:25.757! This was faster than Ted's first time to Watkins Glen in 2010. Congratulations to Bob for both beating Larry, and beating Ted's previous best time in an SM trim car. The Sunday races were run on the NASCAR "short course" which was a first for all of the Cahall brothers. For the SM class Ted, Bob and Larry finished: 9th, 11th, 13th respectively. For STL and SM5, Ted finished 1st and 3rd. Bob beat Larry for both races on the long and short courses!